You are here: Home / Free Samples | Freebies | Free Stuff / Time Magazine, F_R_E_E! No Bill, No Credit Card – Ever! 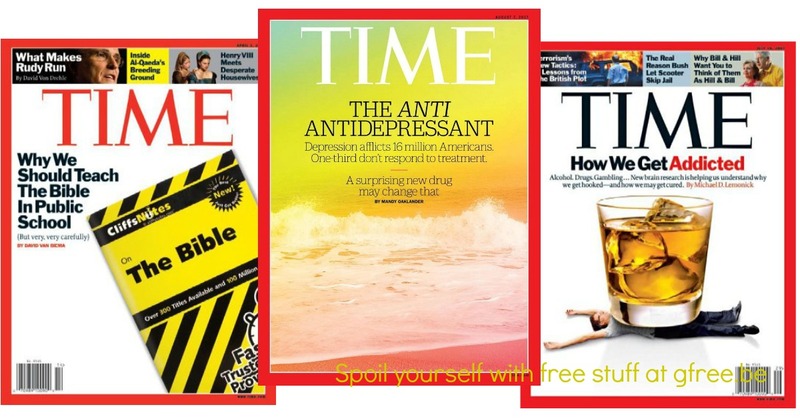 Head on over and claim your FREE Time Magazine subscription! Time is a weekly publication that covers current and breaking national news. Woah!? Compare to the $220.00 cover price at Amazon! Claim your free magazine (click link) and take a short 1-page survey, you’ll get $20 in rewards instantly! How it works: Claim your free magazine of choice by answering a few questions on a short 1-page survey. You’ll instantly get credit to spend which equals FREE magazines!! Or, you can bank your credit to save up for something else or get different magazines when they’re offered. They offer new surveys each week and they’re all this short and quick! They offer many different free subscriptions, such as: Shape, Rolling Stone, Martha Stewart Living, Everyday with Rachael Ray, Details, Wall Street Journal, Shape, Wine Spectator, Golf Week, Wired, Inc. and lots more. And, they change them up all the time.